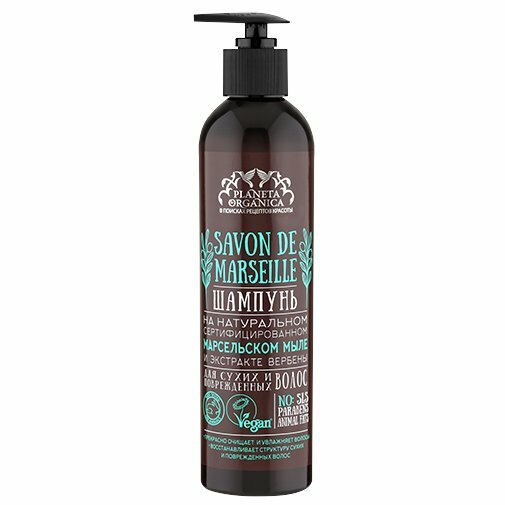 Savon de Marseille Shampoo is produced by the Russian beauty brand Planeta Organica for its Savon de Planeta Organica line. It is specifically designed for dry and damaged hair. The product is formulated with certified natural Marseille soap and verbena extract. It cleanses the hair very gently yet effectively, helps to keep it hydrated, repairs damaged hair structure, and keeps your hair looking healthy. The shampoo is based on 100% natural Marseille soap made according to the ancient French recipe. Its key ingredients are olive oil and sea water. Olive oil contained in the product deeply nourishes and moisturises the scalp, helps to prevent brittle hair and hair loss, makes the hair silky and shiny. The shampoo also contains verbena extract. It soothes and softens the scalp, prevents dull hair and split ends. This ingredient also stimulates hair follicles and thus makes your hair grow faster. Other natural ingredients contained in the shampoo include wheat germ oil, geranium oil, and cedarwood oil. Savon de Marseille Shampoo is free of SLS, parabens, animal products, artificial colourants and fragrances. Certified by ECOCERT and the Vegan Society (the Vegan Trademark standards). Directions. Apply onto wet hair, lather. Rinse thoroughly with warm water. Repeat if necessary. Ingredients. Aqua, Potassium Oleate, Cocamidopropyl Betaine, Lauryl Glucoside, Lippia Citriodora Flower Water, Triticum Vulgare Germ Oil, Maris Sal, Rosa Damascena Flower Water, Pelargonium Graveolens Oil, Cedrus Deodara Wood Oil, Sodium Chloride, Guar Hydroxypropyltrimonium Chloride, Citric Acid, Benzyl Alcohol, Benzoic Acid, Sorbic Acid, Parfum, Citronellol, Geraniol, Linalool, Citral. Want to buy Savon de Marseille Shampoo? Call us or submit your order via our web site!